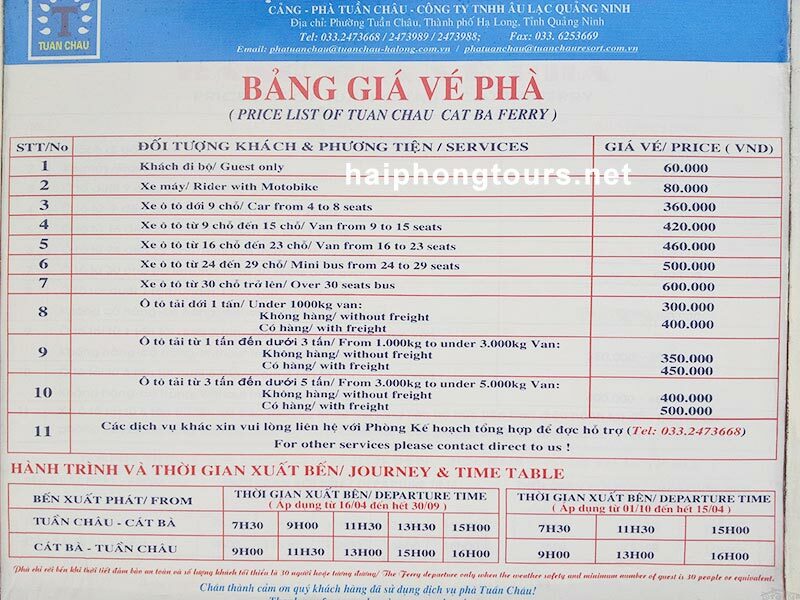 How to get to Cat Ba island after Halong bay tour? How to get to Cat Ba island after Halong bay tour? This is very common question to explorers. Around 2 years ago, it was pretty easy. You just ask captian to drop you off at Gia Luan harbor. Then you can catch bus to Cat Ba Town. But now they do not allow to do that. Depends on where you will end your tour. If you do Halong Bay day tour, they will drop you off at Tuan Chau harbor. Time of arrival is around 16h-16h30. It’s late to catch the last ferry to Cat Ba at 15h00. If you do Halong bay 2 day tour, they may drop you off at Tuan Chau harbor or also Hon Gai harbor. You may need to stay on Tuan Chau island 1 night then next day catch ferry to go at 7h30, 9h00, 11h30, 13h30, 15h00. If you choose this option, please get back to Hai Phong city. Then stay 1 night in Hai Phong. Next day please go to Binh pier to catch hydrofoil at 7am, 9am, 11am, 1pm or 3pm. If you choose this option, please get back to Hai Phong city. Then stay 1 night in Hai Phong. You may need to reserve Hai Phong Car Rental service in advance. Then next day, use private car to go to Got pier over Tan Vu – Lach Huyen bridge. Now catch ferry to Cai Vieng (car and people) every 30 minutes. Then go straigh to Cat Ba town or any places you like. I do hope this article helps you a lot in planning your travel. Please let me know if you need any further information or chat with me at http://chat.vietnamexplorers.com or Whatsapp +84975200357. Thank you and I am looking forward to hearing from you soon!